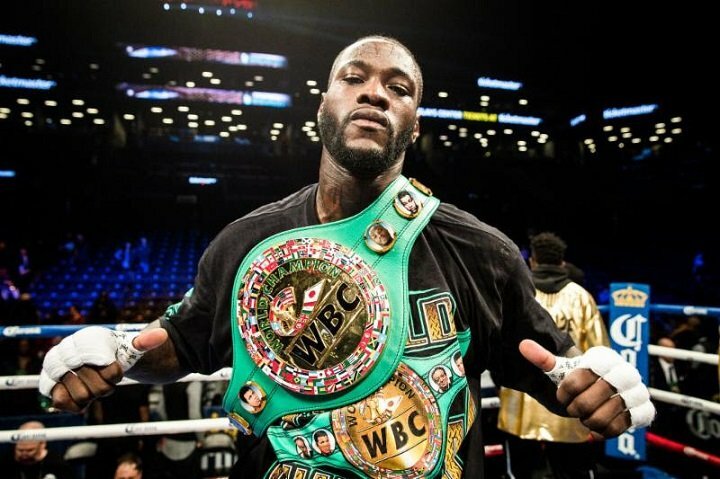 Wilder tears into Joshua as AJ takes WBA-ordered fight with Povetkin: I knew I smelt P***y! After months of negotiating, talks have broken down between the sides representing rival heavyweight champions Deontay Wilder and Anthony Joshua. Joshua has been ordered by the WBA to face mandatory challenger Alexander Povetkin next, the governing body apparently losing patience with the going-nowhere talks between Joshua and Wilder. The WBA gave Joshua 24 hours to sign to defend his belt against the Russian star, or else be stripped. This has reportedly driven AJ to take the Povetkin fight and the word is it will likely go ahead in September. It’s not at this time clear whether or not the two sides will look to resume talks after each champion’s next fight – AJ against Povetkin and Wilder against TBA; possibly Dominic Breazeale. But with this latest turn of events, there may be no longer a chance of anything like good will being in place between the two rivals. Will we ever get to see this huge battle of heavyweight punchers? Not this year, that’s for certain. 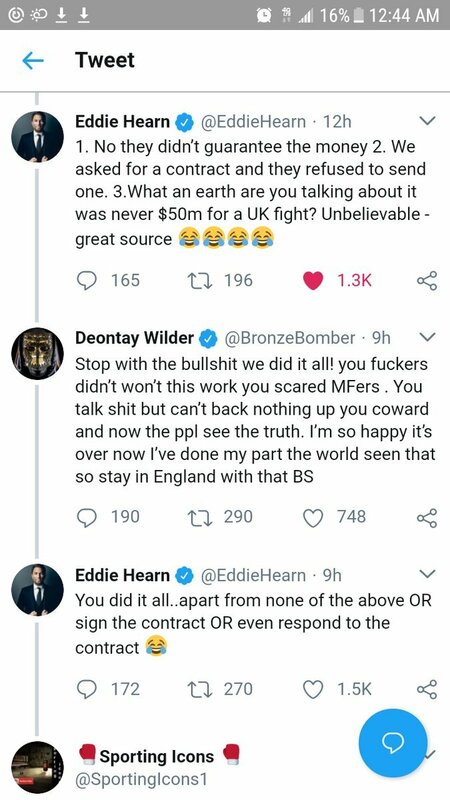 Wilder’s trainer Jay Deas, in speaking with The Daily Mail, said that it is now his fear that this fight, one that everyone wants to see so badly, will not happen. Meanwhile, former champ Tyson Fury has stated that Joshua and his team are scared of Wilder and want no part of him. So did Joshua have his hand forced by the WBA, or is there really a reluctance from him to risk taking on the WBC champion? 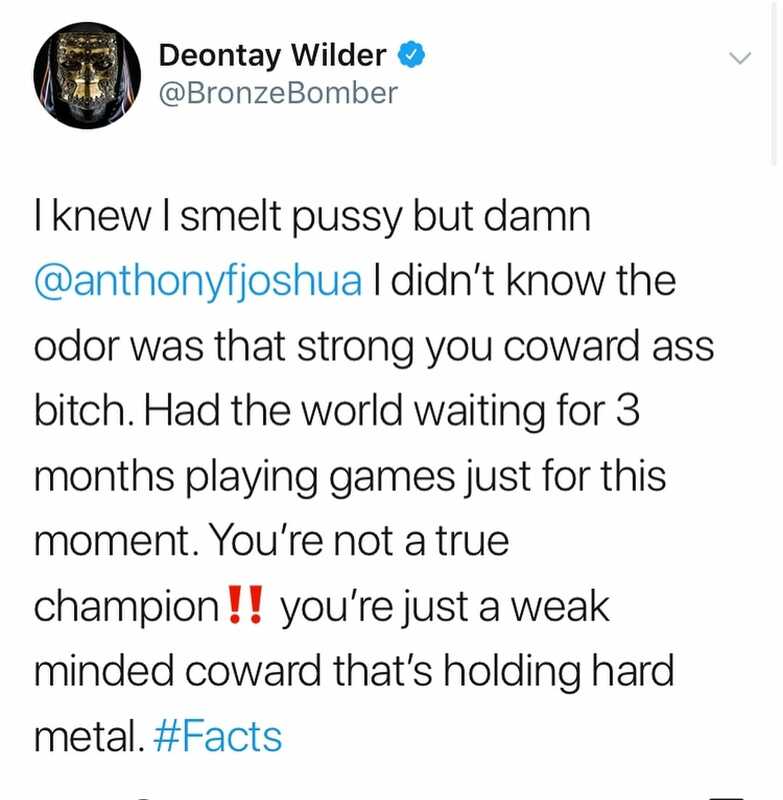 You are here: Home / Boxing News / Wilder tears into Joshua as AJ takes WBA-ordered fight with Povetkin: I knew I smelt P***y!